Sorry for the Weeknight Gourmet hiatus! I was a bit under the weather and then was on vacation! We had a great time in Vail, Colorado. But, after a over a week of dining out, I was very excited to cook a meal at home! 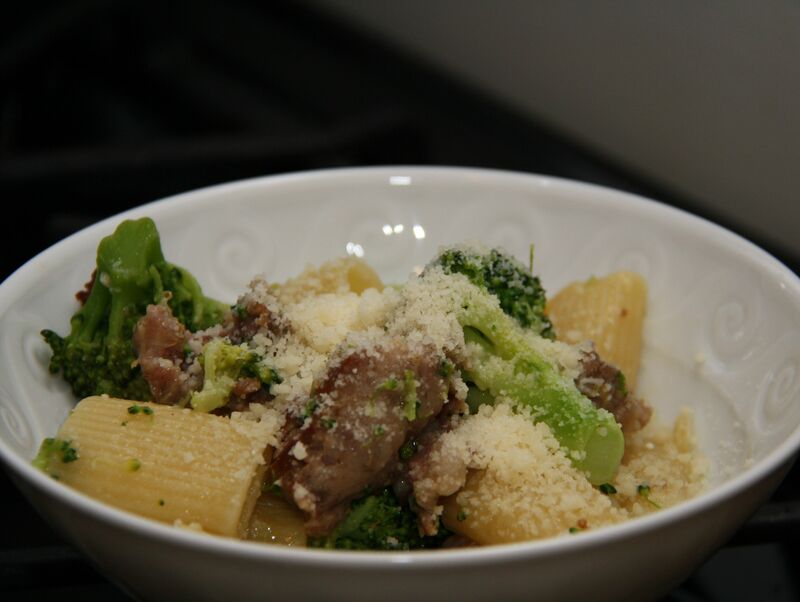 The latest Everyday Food magazine greeted me upon our return and I couldn’t resist the cover recipe, Rigatoni with Sausage and Broccoli. The recipe is super easy and has great flavor from the sausage and the lemon-anchovy-garlic oil. I know some people shy away from anchovies but they provide a great salty flavor. The dish was a hit! I plan to make it again. Cook pasta in a large pot of boiling salted water until tender but still firm to bite, adding broccoli the last 2 minutes of cooking time. Drain, reserving 1 cup cooking liquid. Meanwhile, in a small bowl, combine the oil, garlic, lemon zest and juice, anchovies, 1/2 teaspoon salt, and 1/4 teaspoon pepper. Cook sausage in a pan over medium heat, breaking up with a wooden spoon, until cooked through. Add broccoli and pasta plus oil mixture. Toss well, adding enough pasta cooking liquid to make a thin sauce.